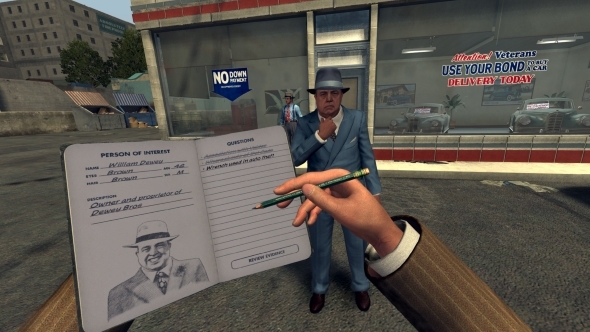 L.A. Noire: The VR Case Files is the best VR game I have ever played. More than that, it is one of the best gaming experiences I have ever had. Defying the odds, it feels like a bespoke virtual reality game, rather than a decade-old console title bent and hammered into a VR mould. Should you get the chance to play it yourself, you will quickly come to understand why it has cast its spell so effectively over me. Related: the best VR games on PC. I spent some time with the game at Rockstar’s offices back in November, but have finally had chance to play the whole game now. As soon as the opening seconds of the “Armed and Dangerous” case began I fell in love with it all over again. Picture the scene: I am outside Westlake Savings & Loans, and the building is currently suffering at the hands of half-a-dozen robbers. Bullets zing off car fenders and thud against tarmac. One criminal is crouched behind a car on the roadside, blocking my advance into the building itself. I pull a shotgun from the trunk of the squad car, operate the pump action, and press myself against the side of a truck for cover, ready to deal out lethal justice. OK, let’s rewind a second. 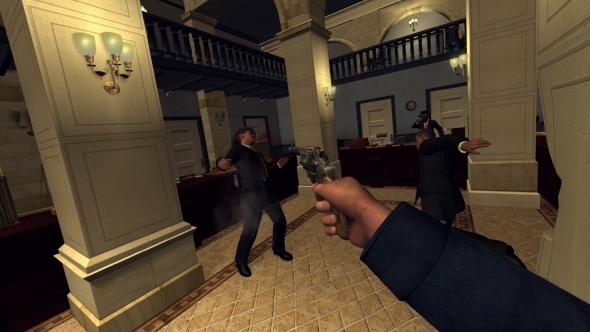 Games largely automate things, so it is important to emphasise that in L.A. Noire: The VR Case Files you are physically enacting every movement required to get Officer Phelps into position. With aid from the HTC Vive controllers, you physically move your arms to pull the shotgun from the trunk. With your other hand you slide the pump-action handle back and forth, priming it for action. 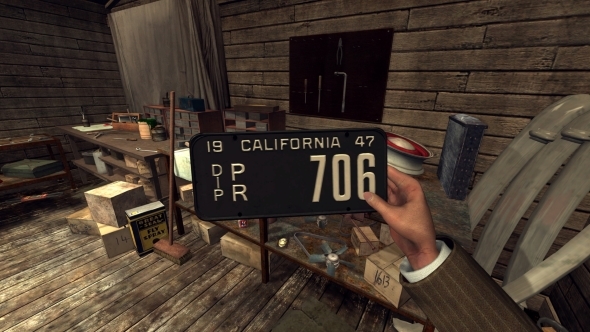 We have all done the ‘ch-chunk’ action with our hands while imagining a Remington resting in our empty palms, but VR turns that action into an exciting and vital component of playing L.A. Noire. Then comes the actual shooting. I lean – actually lean with my body – from behind the truck and fire the shotgun. Buckshot shatters the windows of the car and tears through the man behind it. My AI partner and I run up to the bank and hunker down by the door. I side step into the open for a moment and unload a further three shells, cycling the pump between each, until the clattering of masonry is replaced with the empty click of the trigger. I pull back and reload, which is done by miming feeding cartridges into the gun. There is a reason I have spent so many words detailing this shootout. Despite VR’s suitability for physical, first-person experiences, it has not truly had a good shooting game. I recently played both Fallout 4 VR and Doom VFR and found their gunplay hollow. Doom’s approach was notably surprising given that it is a game obsessed with guns and yet its VR equivalent pays little attention to them. They all reload automatically and are swung like foam props in a single hand. They are all virtual with none of the reality. It is different for L.A. Noire. I love how, after opening the cylinder to reload bullets into a revolver, a quick flick of the wrist will snap it back into place, just like in the movies. It pays real attention to how guns actually operate, and as such fulfills the promise of virtual reality: it feels like you are there. Such attention to detail is what Rockstar is best at. I admire the developer’s obsession with the mundane; how they replicate the smallest elements of everyday life. In GTA, this is the buzz and flow of a city – something we can all relate to. 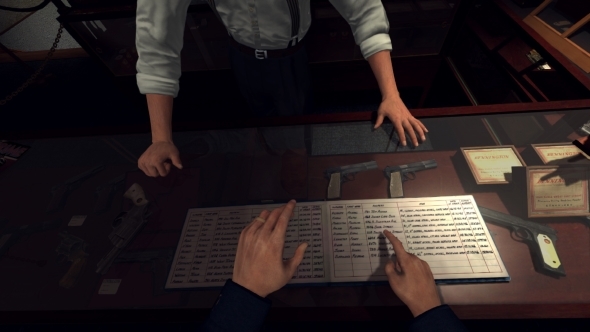 But with L.A. Noire: The VR Case Files it is about more immediate, tactile things. You open a car by literally pulling the door handle and start the engine by turning the key. Your notebook is accessed by using your hands to pull it from your jacket pocket. Grab the brim of your trilby hat – just visible at the top of your vision – and you can doff it when talking to witnesses, or sling it across the street. Evidence can be twisted and manipulated in your virtual hands, searching every surface for a bloodstain, serial number, or some other clue. There are seven cases to play in The VR Case Files, making it significantly shorter than the original game, but each mission has been selected to showcase specific virtual reality mechanics. The aforementioned Armed and Dangerous mission and the finale, A Different Kind of War, demonstrate the gunplay, while The Silk Stocking Murder and Buyer Beware demand that you crouch down low to inspect grisly murder victims for clues. The Consul’s Car features a street race in ‘40s vehicles that concludes with thundering down the concrete spillways of the Los Angeles River – ideal for any of you looking to recreate scenes from Grease. And, dare I say it, all of these cases feel better in VR than they do in the regular game. I say that as a huge fan of the original who is replaying it on Nintendo Switch right now. It is difficult to play the same missions through again without the engaging qualities of VR. If feels like the magic is missing. Despite the frequent fade-to-black screens used to calibrate the headset between scenes and the choppier flow thanks to some occasionally mandatory warp-to travel, it really does feel as if The VR Case Files has become the definitive way to play L.A. Noire. The care, detail, and – most importantly – excitement that Rockstar have injected into physically embodying a detective is what makes The VR Case Files such a success. It should also be used as a case study for other virtual reality developers, in both how to retrofit traditional games with VR, and how to create an immersive atmosphere through stereoscopic visuals and physical actions. Any studio with an interest in the HTC Vive would be foolish to ignore the achievements of the best VR game to date.